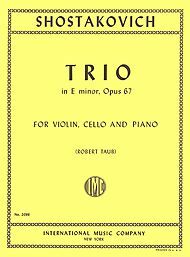 Trio in E minor, Opus 67 by Dmitri Shostakovich. Edited by Robert Taub. 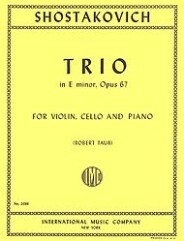 For violin, cello and piano. 20th Century. Difficulty: difficult. Performance parts. Standard notation and piano accompaniment. Composed 1944. 66 pages. Published by International Music Company (2086). With standard notation and piano accompaniment. 20th Century. 9×12 inches.